This week in Southern California has been so beautiful. The days have been clear and sunny, and the nights have been cool. These colder nights make me crave something warm and comforting. I love to curl up with a blanket and a big bowl of soup. Luckily, there are many keto-friendly soup options! Most canned soups are high in carbs and are made with things like GMO’s and High Fructose Corn Syrup, but, actually, soup can be healthy and keto-friendly. In my cookbook, The Easy 5- Ingredient Ketogenic Diet Cookbook, there are five keto soup recipes. But when I want something even easier, I turn to Kettle and Fire’s amazing Miso Soup. This Miso Soup is made with Kettle and Fire’s Chicken Bone Broth. 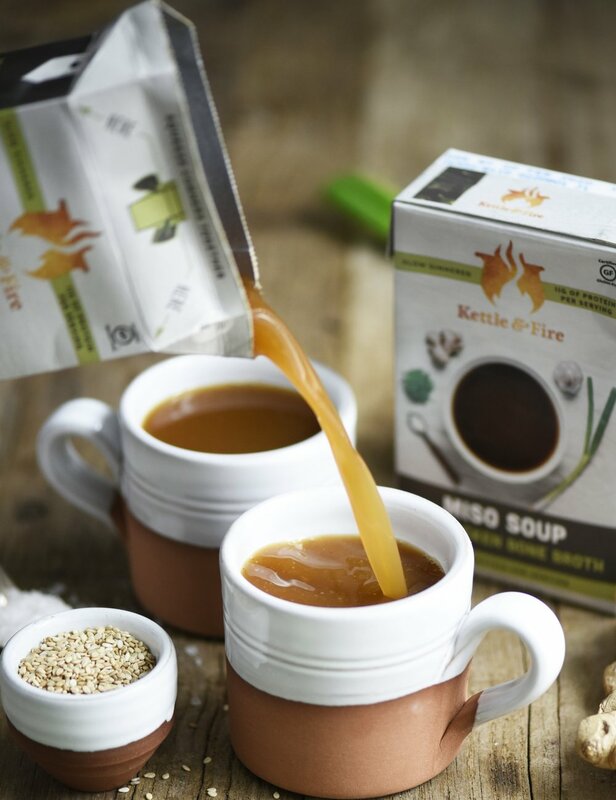 (You can read about the bone broth and it’s benefits at KETO PRODUCT REVIEW: KETTLE & FIRE BONE BROTH). It is slow simmered for over ten hours, and packs 11 grams of protein a serving. The specially sealed, 2-cup carton means that you can store it for long periods of time, and it is the perfect size to bring to the office for lunch. It is a great on-the-go meal: packed with nutrients and protein. You can even enjoy it after a work-out to keep you full and your gut happy all day. Try adding some Bok Choi, Avocado, and Mushrooms to Kettle and Fire’s Miso Soup for something a little different. Or add some Miracle Noodles for a hearty keto meal on a particularly cold night. Don’t forget to use the keyword KETOINTHECITY15 when you order to receive 15% off your first order from Kettle and Fire.